Grapefruit and resinous pine notes dominate the nose, while the palate enjoys a significant malt body that perfectly balances the intense hop presence provided by the 100% Centennial hop additions. A modest amount of IBUs makes this beer dependably drinkable, even among those that aren’t typically into IPAs. Place silicone washer on the spigot so that it is snug against the plastic flange. Then, insert the spigot assembly into the fermenter. Place the second silicone washer inside the fermenter so that it is snug against the glass wall. Next, screw on the nut inside the fermenter with the wide flat side against the inside silicone washer. Gently hand tighten but be careful to not over-tighten. Test the fermenter for leaks by filling it completely with water and letting it sit for 15-30 minutes. Fill clean fermenter with warm water to rib line 1, then add ½ pack (about 1 tablespoon) of no-rinse cleanser and stir until dissolved. Once dissolved, the solution is ready to use. Save the remaining ½ of no-rinse cleanser for later because you will need it for bottling. Place the gasket ring underneath the lid and screw the lid tightly on to the fermenter. Make sure to tighten the small black cap on the lid as well. Gently swirl the fermenter so that the cleaning solution makes contact with the entire inside of the fermenter, including the underside of the lid. Allow to sit for at least 2 minutes and swirl again. To clean the spigot, open it fully and allow liquid to flow for 5 seconds and then close. Pour the rest of the solution from the fermenter into a large bowl. Place your spoon/whisk and measuring cup into the bowl to keep them cleaned throughout the brewing process. Leave them immersed for at least 2 minutes in cleaning solution prior to using. Pour 4 cups of water into a 2-3 qt. pot and bring the temperature of the water up to 165°F. Place the grains in a muslin sack and tie it closed. Drop the grain sack into the hot water and let it steep for 30 minutes between 155-165°F. Carefully lift the grain sack out of the pot and place into a strainer/colander. Rinse the sack over the pot with ½ cup of hot water. Let it drain but do not squeeze the grain sack. Discard the used sack. Bring grain water to a boil, add 1 (1/2 oz.) packet of Centennial hops, and boil for 5 minutes. Remove the pot from heat. Add the dry malt extract into the hot mixture and stir with a whisk until dissolved. Then add 1 (1/2 oz.) packet of Centennial hops and stir for one more minute.This mixture is called “wort”. Add 2 qts. of cold, refrigerated water (35-45°) to the fermenter. Slowly pour the wort into the fermenter, including hops, and top it off to just below the rib line 2 of the fermenter with more refrigerated water. Sprinkle the yeast into the fermenter, add the lid and replace the cap with the airlock. Ferment for 14 days at the correct temperature range of 65-72°F. Next, quickly open the lid and add the last 1/2 oz. packet of Centennial hops into the fermenter. This is called "dry hopping." Allow to ferment for an additional 7 days, no longer than 21 days total. Should taste like flat beer, without being too sweet or cidery. After 3 weeks, once you are satisfied with the taste, it is time to bottle and carbonate. Bottles: Your kit does not include bottles and caps, but you have options. You will need enough bottles to hold a total volume of 128 oz. See the options from Mr. Beer here. We recommend using Mr. Beer 25 oz. (740ml) bottles because of the ability to use screw-on caps. You will need 5-6 bottles (sold in quantities of 12). These bottles are great because they are large enough to reduce bottling time and small enough to equal 2 servings. They are compatible with Mr. Beer carbonation drops (sold separately). You can also use glass bottles with the additional purchase of caps, cappers and capper. Another option is to use swing-top bottles. Carbonation: Adding priming sugar to the bottles of beer allows the remaining yeast to metabolize it into carbon dioxide (CO2). Fill a 1-gallon container with warm water, add the remaining ½ pack of no-rinse cleanser and stir until dissolved. Use this to clean the bottles. Distribute the cleaning solution equally among the bottles. Screw on caps and shake bottles vigorously. Allow to sit 2 minutes, then shake the bottles again. Remove caps and empty all cleaning solution into a large bowl. Use this solution to clean any other equipment you may be using for bottling. Do not rinse. Add 2 carbonation drops to each 25 oz. bottle. You can also use table sugar. 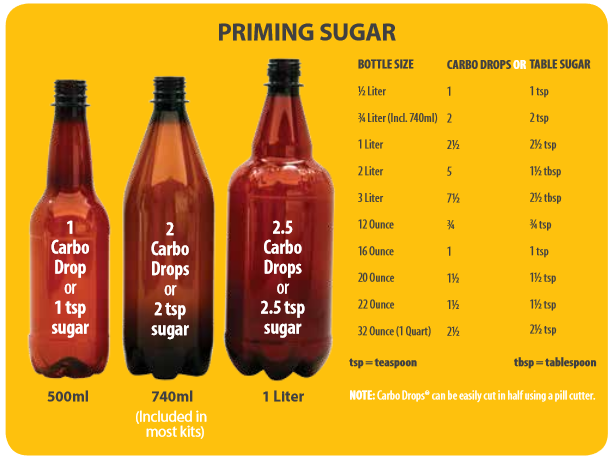 See priming sugar chart here. To reduce foam, fill each bottle at an angle from the spigot. Fill each bottle to about 1 inch from the top. You may need to tilt the fermenter for the last 1-2 bottles. Store the bottles upright in a cool, dark place at a consistent temperature between 68-76°F for at least 3 weeks. Make sure to keep out of direct sunlight. If the bottles are exposed to colder temperatures (below 68°F) they will take much longer to carbonate. If they are exposed to warmer temperatures (over 76°F) off-flavors may be produced. The ideal carbonation time is 3 weeks total. The beer is now ready and should be refrigerated for 24 hours before drinking to stabilize the carbonation. Some beers, such as porters and stouts, may benefit from further conditioning. Conditioning involves aging the beer between 68-76°F to further enhance the flavor and mouthfeel. To ensure your next batch of beer is as good as the first, you need to clean your equipment immediately after use. While rinsing is good, only soap and water will result in clean equipment for your next brew. The best cleaner to use is Oxygen Brewery Wash which is available here. It effectively breaks down residue without leaving any flavor or foam-damaging particles after rinsing. You can also use liquid soap as long as it is unscented and is thoroughly rinsed off with warm water at 105-115°F. Scented soap or improper rinsing can leave a film on your equipment that will lead to off-flavors in your next beer. Immediately after use, remove and disassemble the spigot assembly from the fermenter, then thoroughly wash all parts in warm water using a clean, soft cloth and Oxygen Brewery Wash or clear unscented liquid soap. Then thoroughly rinse with water. Do not use scouring pads, wire brushes, sponges or abrasives during cleaning because they can create small scratches that harbor bacteria. Bacteria is bad and will infect your beer. Always clean and rinse all equipment, including bottles, immediately after use.